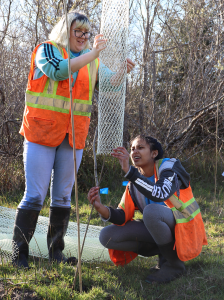 Marshfield High School students Gracie Schlager, left, and Archal Devi slide a mesh screen around a newly planted seedling to ward off hungry wildlife. COOS BAY – On a sunny February afternoon, a group of local high school students is giving nature a helping hand. Working on swampy ground near the Eastside Boat Ramp, teens are planting trees to promote a native wetland habitat. Others are uprooting invasive Scotch broom. This is the Coos Watershed Association’s youth stewardship program, an initiative that promotes native plant species while teaching youngsters to advocate for responsible landscape practices. It’s one of 57 organizations and projects receiving grants this week from the Coquille Tribal Community Fund. The program will receive $3,000 from the Tribal Fund, part of more than $290,000 being distributed during this year’s “Grant Week.” A second environmental grant, for $5,000, will help Friends of Coos County Animals pay for neutering cats whose owners can’t afford the service. Alexa Carleton, the watershed association’s education program director, said the youth stewardship program is six years old. During the school year, the program draws high schoolers from Coos Bay. In the summer, it offers paid internships to teens from throughout the Bay Area. The teens perform hands-on labor while learning environmental leadership. One project was a gravel area at the Coos History Museum, which the teens turned into a native dunes habitat. Coming soon will be a planter box in downtown Coos Bay, which they likewise will sow with native grasses. Interpretive signs will explain the unconventional landscaping. Native plants help filter pollution, prevent erosion and provide wildlife habitat. But not everything that grows wild is a native plant. Many are invaders, such as ivy, purple loosestrife, and that thorny juggernaut, Himalayan blackberry. These thrive and spread because species that control them in their home territory are not present in their new surroundings. If you’d like to exercise watershed stewardship on their own property, you’re invited to contact the Coos Watershed Association at cooswatershed.org. The group can advise you on planting native species and connect you with resources to help with problems such as drainage and invasive species. The association also welcomes tax-deductible donations. While the group gets much of its support from grants, most grants are for specific projects. Direct donations help cover basic operating expenses. The association will host its second annual Mayfly Festival on May 19 at Mingus Park. It’s a hands-on celebration of youth, science, water and community connection. Learn more at https://coosmayflyfestival.weebly.com/. Supported by proceeds from The Mill Casino in North Bend, the Coquille Tribal Community Fund distributes grants each year to nonprofit organizations and public agencies. This year’s grants total $291,164. Since 2001, the fund has distributed more than $6.1 million. Learn more at www.coquilletribalfund.org.